Yeah, That’s a fantastic shot isn’t it? You know, that was a home-made lens, I made that lens. There was no lens like that then, it made marvelous distortions. I love it, the light would flare out. As far as I know this video is from Olympia, Paris on his 25th birthday, May 24. 1966. If this is wrong, then there is a video of Bob with the same suit and same song from Paris as well as Glasgow. I was at the Glasgow show with my sister and a friend in 1966. I would love to think that this clip came from it. Nothing else exists in audio or video from this show, as far as I am aware. If anyone has anything else, please post it! The reason why none of the clues match up is because this is not a concert film. It is Pennebaker filming a rehearsal/tryout/special during daytime. There is too much light from the window and no audience shots (which Pennebaker liked to do). That why he refers to it as his little film, as ‘mixed up’ mentions above. while in Glasgow he was sitting on a piano stool (check out the video). working on it before the Paris concert on May 25. Where it was or was not…is it important? The music is by far the most important… but still for some of us the details & facts also matters..
i have spent many hours trying to track the locales of the various live performances which were included in ‘document’ and ‘no direction home’. a danish photographer – bjorn larson ask — took photographs at the press conference in copenhagne and also at the concert. 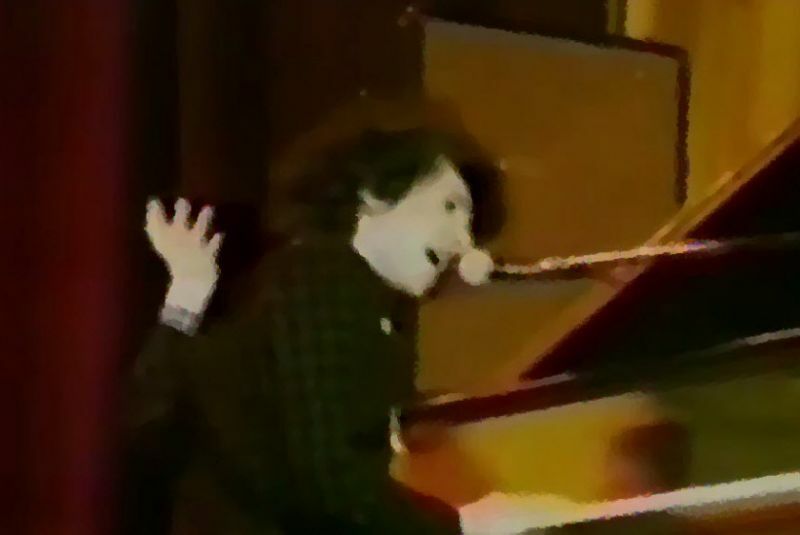 one photo, with dylan standing at the piano, graced the back cover of ‘the telegraph’, issue 55.
the piano stool evident there is not the same one as in the video. also: i purchased the video tape which (to my knowledge) included this video footage of ‘thin man’. the tape was a mixture of various musical items, of which this was the only dylan. it was described as ‘glasgow 1966’. not totally certifiable, of course, but very often things like this which come from otherwise uninformed dylan sources bear as much, or even more, authenticity than material emanating from the experts. the 1966 camera crew was most certainly in attendance for the glasgow shows, as there is further documented footage included in the two films. Thanks for this insightful comment Glen. I’m convinced…. I will have to edit my post..
Garth Hudson is absolutely brilliant here… and on the other 66-concerts I’ve heard. This performance in most definitely not from Copenhagen. Most likely venue is Glasgow, May 19. In C.P. Lee’s great book “Like The Night”, I found a quote from D.A. Pennebaker commenting on the lens he used… (page 193), but I havent found anything about the date & venue. Why is it “definitely not from Copenhagen” ? I have added some links at the bottom of my post.. the last one (Eat the document details) indicates May 1 – Copenhagen….